Update: Google&apos;s Android Nougat update is now on a little over 7% of active devices as of May 2017, and the six-month-old software is launching on more handsets. Here&apos;s the latest list of Android Nougat phones and tablets. There&apos;s a good chance your phone – whether it&apos;s a Samsung Galaxy S7 Edge, Huawei P9 or Honor 8 – already has the latest Android Nougat software update, or it&apos;s coming in the next few weeks. But it&apos;s often extra confusing because the Android Nougat release date for some phones doesn&apos;t always reflect what you see in your software update menu. In the US, individual carriers like AT&T, Verizon, Sprint and T-Mobile have to sign off on each update, so it can take additional weeks (sometimes months) to get that coveted Android updated. That&apos;s why we&apos;re break down the phones that have Android 7.0 Nougat, Android 7.1 and the brand new Android 7.1.2 update. Here&apos;s everything we know. Android Nougat is Google&apos;s big refresh of its phone and tablet operating system – an OS that&apos;s been so thoroughly refined that the company is now more than halfway through the alphabet with names, at letter 14 of 26. It won&apos;t stop at Android 7.0, either. Android 7.1 launched on Nexus devices in October and Android 7.1.1 came to Google phones and tablets on December 5. Android 7.1.2 is already out of beta on select phones, while Android O (maybe called Android Oreo) is now in early beta ahead of Google IO 2017. Android Nougat is out right now, but when you&apos;ll get the upgrade is going to depend on your device. The release date is rather staggered. Good news, it&apos;s pre-loaded on the new Google Pixel and Google Pixel XL and it&apos;s available to download on Google-made devices like the Nexus 6P, Nexus 5X, Nexus 6, Nexus 9, Google Pixel C, and the Nexus Player. No waiting required. You&apos;re getting Android 7.1.2 Nougat on all of these devices, except for the Nexus 6. An error caused Google to roll it back from Android 7.1.1 to Android 7.0. Sadly, if you have a Nexus 5, you&apos;re going to miss out on the Android Nougat upgrade altogether. It misses Google&apos;s two-year cut off by a year. But it&apos;ll still get another year of Google&apos;s all-important security patches. Samsung, LG, HTC and other phone makers, meanwhile, have to rework their own version of the software and push it out to users, and that can take months. This hasn&apos;t stopped Google from moving on to the Google Daydream VR-ready Android 7.1 and even Android 7.1.1 and 7.1.2, which it started rolling out to the Nexus and Pixel devices on December 5. Android Nougat is now available for the Samsung Galaxy S7 and Galaxy S7 Edge, and we don&apos;t mean that the phones are running that rinky-dink beta Samsung had launched last November. The real update is here in full. T-Mobile was the first US carrier to officially launch Android 7.0 Nougat on the S7 and S7 Edge, followed a bit later by AT&T and Sprint. Verizon took several extra weeks to update the Galaxy S7 series. For unlocked phones, Android 7.0 Nougat is now available for the Samsung Galaxy S7 and S7 Edge, and it&apos;ll soon come to older phones and tablets, too. Nougat will arrive before the first half of 2017 is over on Samsung devices all the way back to the Note 5, S6, S6 Edge and S6 Edge+. Sorry, unwavering old Samsung Galaxy S5 owners. Your time is up. Newer budget options like the Samsung Galaxy A3 and Samsung Galaxy A8 will be able to download the new Android firmware. Samsung tablets getting Android Nougat include the Samsung Galaxy Tab A with S Pen and Samsung Galaxy Tab S2. The Tab S2 needs needs to be the LTE unlocked version for this to happen, not one tied down to a carrier. All of these software updates may hold you over until you decide to buy the new Samsung Galaxy S8, Galaxy S8 Plus and Galaxy Tab S3, all of which comes with Android Nougat pre-loaded. LG technically launched the first Android Nougat phone back in September with the LG V20. But that was a "world&apos;s first" title only South Koreans benefited from initially. The dual-lens camera phone didn&apos;t launch in the US until October 28, and it&apos;s not even coming to the UK. Thinking of upgrading to the LG G6? Well, everyone, right away, can get in on the Android Nougat action that way. It just launched with the Android 7.0, the AI helper Google Assistant and a killer 18:9 screen in a slim body. LG G5 owners yearning for the same Android Nougat update need to check the Software Update menu right now. It&apos;s available for all G5 phones. It&apos;s available in the UK on SIM-free LG G5 phones, and in the US on Verizon, Sprint and T-Mobile. AT&T&apos;s better-late-than-never LG G5 Android Nougat update started rolling out in late February. The LG V10 and LG G4 are now confirmed to receive Android Nougat, but it&apos;s low-priority for these 2015 phones. They&apos;re not expected to see the update until mid-to-late 2017. The Sony Xperia X Performance, Xperia X Compact and Xperia XZ are now up to date with Android 7.0 Nougat. But there&apos;s one Sony phone that&apos;s further along. The Sony Xperia X can taste-test Android 7.1.1 right now, making it the first non-Google phone to get this particular update. It requires installing the Sony Concept app that&apos;s being using to re-build Sony&apos;s Android operating system. Sony Xperia Z5, Xperia Z5 Premium, Xperia Z5 Compact and the Xperia Z3+ all have Android Nougat and so does the Xperia Z4 Tablet. But you won&apos;t find it on the Xperia Z3. It&apos;s an odd twist, for sure. While we were surprised to see Sony weigh into the Android Nougat developer with the Z3, it didn&apos;t follow through with the full Nougat upgrade for this phone. We&apos;re still waiting for news regarding the Xperia XA and Xperia XA Ultra. No specific time frame has been announced, but stay tuned. If you&apos;ve bought an HTC phone launched in the past year or two, you may have access to Android Nougat soon enough. If you just bought the HTC U Ultra, you have it right now on your massive 5.7-inch phone. It&apos;s already rolling out to unlocked HTC 10, One A9 and HTC One M9 handsets in the US and UK, and while the update was delayed in the rest of Europe, everyone there should have it now, too. HTC had confirmed it would bring the Google update to the HTC 10, One A9 and One M9 by the end of the 2016. It didn&apos;t make that deadline everywhere. But, it&apos;s here now and that&apos;s all that matters. Android Nougat isn&apos;t available for HTC One M8 and never will be. HTC told TechRadar that it will not get the latest upgrade. You&apos;re going to have to buy a new phone for this update. Motorola has now confirmed which phones it will upgrade to Android 7, and its list of phones is rather long. Android Nougat is already out for the Moto Z and US-exclusive Moto Z Force, and it just launched on the Moto Z Play – both the unlocked and Verizon versions of the battery-life-focused smartphone. Nougat also launched for the Moto G5 Plus and Moto G5, which came out after the update. No need to wait for the software on this phone. Its X-series phones – like the Moto X Style, Moto X Play and Moto X Force – are due to get the update in May after a delay. It&apos;s been better news for Motorola&apos;s mid-range G entries line: the Moto G4 and Moto G4 Plus now have Nougat. So does Verizon&apos;s Droid Turbo 2, and stay tuned for updates on the Droid Maxx 2. So far only the Huawei Mate 9 has gotten Android 7 software upgrade, while the newly launched Huawei Mate 10 comes it onboard straight away. Huawei has announced it will be releasing Nougat updated for the Huawei Mate 8 and Huawei P9 by the end of March 2017. But you might not even have to wait that long, as Android Soul reports that Nougat has now arrived for both the P9 and Mate 8 in China. Of course, that won&apos;t help most of you, but it suggests the update could be hitting the rest of the world soon. The Chinese manufacturer will also apparently update the Huawei P9 Plus, P9 Lite, Huawei Nova and the Huawei Nova Plus later in 2017. There&apos;s no word on whether the Huawei P8 or Mate S will be getting the upgrade to EMUI 5.0 (which comes with Android 7 features). It looks like both of those phones are set to be left behind, despite being quite recent devices. The Honor 8 and, finally Honor 6X, now have the Android Nougat update. For a while, it was only the Honor 8 with the software upgrade. That&apos;s really good news because we liked these unlocked Android phones, so it&apos;s a win-win if you picked up either budget phone. Both phones also come with the newly improved Emotion UI 5.0 overlay we have been able to experience on the Huawei Mate 9. OnePlus 3 has Android Nougat 7.0 after a few months of the Android beta and the company&apos;s own OxygenOS 4.0 being tested on the phone. The new OnePlus 3T launched with Android Marshmallow, and now, it is also being fed the Nougat update. Even better, both the OnePlus 3 and OnePlus 3T have access a to an all-new Android Nougat update. You can test out Nougat 7.1.1 on the phone now. What about older OnePlus phones? We expect to see Android Nougat come to OnePlus 2, but it makes sense that OnePlus would prioritize its latest phones. Just don&apos;t wait around for a software upgrade to the old OnePlus One and OnePlus X. OnePlus One is more than two years old now and is likely beyond the company&apos;s update threshold. OnePlus X uses an older Snapdragon 801 chip and also has a slim chance of seeing the update. It may be time to upgrade to the all-new OnePlus 5 if you have one of these phones. We liked the ZTE Axon 7 because it&apos;s looks and plays like a high-end phone with a mid-range price. Now for the true test: how quickly will it get Android updates? Well, Android Nougat has finally come to the Chinese phone after an obvious tease and slight delay from the original ZTE news announcement. Best of all, Android 7.0 Nougat on ZTE Axon 7 gets owners of this unlocked phone a way to step into virtual reality with Daydream VR compatibility. Axon 7 was the first Android Nougat phone to be "Daydream-ready," and while phones like the Google Pixel and Moto Z launched with the VR software first, ZTE has made good on its promise. The updates are going to keep on coming, too. Look for Android 7.1.1 to roll out to the ZTE Axon 7 with Daydream optimizations, T-Mobile Wi-Fi calling support and new emojis. Few non-Google phones have this particular Android Nougat update, so this is a win for the unlocked ZTE Axon 7. Even the little-known Nextbit Robin upgraded to Android Nougat, despite the fact that the company was bought by Razer. It began to show up on phones in late March 2017. We&apos;ve tested out a bunch of existing Android Nougat features below, but there&apos;s one exciting new tool that isn&apos;t part of the regular Android 7.0 update: Google Daydream. A buried menu for VR helper services in the Android N Developer Preview 4, and an equally buried release note for "Android VR" in Unreal Engine 4.12 beta, hinted at a big push for a Google Cardboard successor – sure enough, Google confirmed its VR intentions during IO. The Play Store, StreetView, Photos, YouTube and Play Movies will all support VR, allowing you to jump into games, locations and videos, all via Google&apos;s Daydream VR platform. Google Daydream View is expected to launch in November, but will require even further updated Android Nougat software. Google Daydream is part of the Android 7.1 maintenance update for Android Nougat, and it&apos;s only compatible with the Google Pixel and Google Pixel XL, though other phones like ZTE Axon 7 (the first, non-Pixel Google Daydream phone) will eventually work with the headset and are available to buy right now. True multitasking support has finally arrived as expected, and Split Screen is deservedly the highlight of Android Nougat on phones and tablets. You’re going to be able to open up two apps at once on your Nexus phone or tablet. It’s a popular feature that Samsung and LG phones have incorporated into their Android skins years ago, so it’s nice (and about time) Google is including the same functionality in its own software. It’s easy to launch too – just long press on the recent (multi-tasking) button in the nav bar. Multi-window support could increase enterprise interest in Android tablets and the Pixel C. It’s a bet that Apple recently made when it launched similar split-screen and picture-in-picture features for iOS 9. Meanwhile Android TV gets picture-in-picture mode, allowing you to continue watching your show in a smaller screen while performing another task. There’s also a Clear All button at the top of the multi-tasking menu on your phone to make it simple to close all your apps. Then there’s a new feature called Quick Switch, which lets you jump back to the previous application with a double tap of the recent (multi-tasking) button in the navigation bar. You won’t have to navigate away from your current window (or, now, windows) just to answer an incoming message. You can just reply within the notification that appears at the top of the screen. It worked well enough for the iPhone and iPad when the same idea made its debut with iOS 8 under the name Quick Reply. But Apple’s approach to messages worked strictly with its iMessage app. Google is opening up Direct Reply Notifications beyond Hangouts, and that could mean popular apps like WhatsApp could take advantage of this convenient inline messaging feature. Google is adding a new quick settings menu to the notifications shade you pull down from the top. It’s a lot like the one Samsung, LG and every other Android manufacturer seems to use. 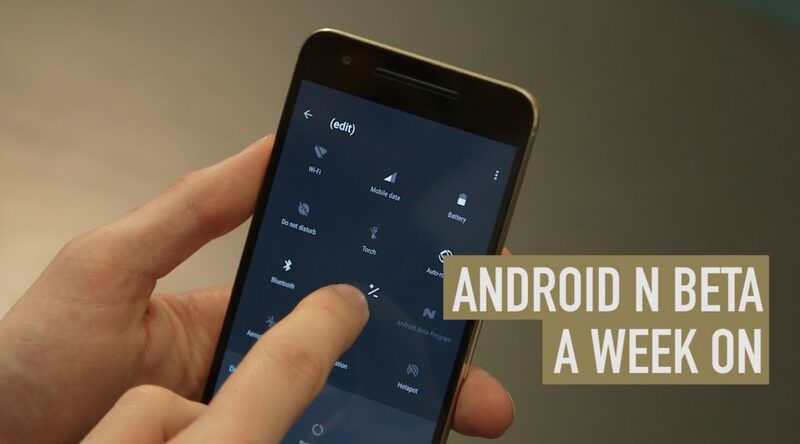 Sure, Google stock Android software has had switches for Wi-Fi, Bluetooth, Airplane mode and so forth, but it required pulling the notifications bar down a second time to reveal the quick settings menu. Now the quick settings toggles are here as soon as you gesture downward once to see notifications. The best news is that all of the buttons are small and unobstructive, leaving plenty of room for notifications. Longtime Nexus users will also be happy to hear that the quick settings switches can be sorted to your liking, much like they can on other Android phones – you won’t need the System UI Tuner to meddle. For example, we often use MiFi more than Airplane Mode, so Mobile Hotspot icon gets promoted to be one of the five icons along the top of the initial quick settings on our Nexus 6P. That little airplane icon is still there for our takeoff and landing needs, but it got the bump to the second swipe menu. Sorting is finally up to you, which is really what Android is all about. Google hasn’t done with the way Android N changes notifications. It also announced that notification cards will be grouped together if they’re from the same app. All messages from a specific messaging app, for example, are bundled together in the notification shade. These grouped alerts can then be expanded into individual notifications using a two-finger gesture or tapping the all-new expansion button. This is basically the opposite of what Apple did in the jump from iOS 8 to iOS 9, switching from grouping them by app to lining them up chronologically. We’ll see which method works best this autumn. There’s more control over your notifications in Android Nougat too, as you can now long-press on a notification to either silence future notifications, or turn them off completely. One of the (literal) sleeper hits of Android Marshmallow has been Doze Mode, Google’s crafty way of saving battery life whenever your device is stationary. It’s basically a deep standby mode. Android Nougat is going to step up the company’s energy-saving software efforts by expanding Doze Mode so that it thoroughly limits background tasks whenever the screen is turned off. That’s ideal for throwing a phone in your pocket or your tablet in a backpack, and then retrieving it the next day or next week without having to recharge it right away. Your “I can’t even” face when you pick up your dead Nexus phone the next morning could be a thing of the past. Google says Android Nougat will deliver its biggest leap forward in graphics performance with the introduction of Vulkan, giving game developers much-needed control of the GPU. That in turn will result in even better graphics and smoother, faster performance. If you’ve downloaded apps from other sources that aren’t the Google Play Store, you’ll now be able to identify where the app came from by going into your Settings, App Info and then Package Installer. There have also been a number of Android runtime improvements, including optimizations to the JIT compiler, which has seen task speeds increase between 30% and 600% compared to the previous version. Updates are also more seamless, with security updates automatically downloaded, and a simple fresh boot-up of your device will see you run the latest offering. It’s also got rid of that annoying ‘Android is updating’ pop up when you restart after an update. Google Assistant launched with Android 7 on the Pixel and Pixel XL phones. It&apos;s a new voice activated Assistant which replaces Google Now. Previously you couldn&apos;t input information into Google Assistant without speaking to your phone, but a new APK breakdown has suggested Google will soon update the Pixel and Pixel XL so you can just write into Assistant directly. It means you&apos;ll be able to use all the useful features of Google Assistant without having to embarrassingly talk to your phone. Google has confirmed the new &apos;Launcher Shortcuts&apos; feature that debuted in the second beta for Android Nougat is ready for pressure-sensitive display technology. This will make it easier for Android manufacturers to bring 3D Touch-like technology to Android handsets, as it&apos;s baked directly into the operating system. Then there are extra security features, such as file-based encryption and Direct boot, which help your device start up faster while running your apps securely. Last, and by no means least, Android Nougat bring support for Unicode 9, which among other things, will bring with it the introduction of 72 new emoji.